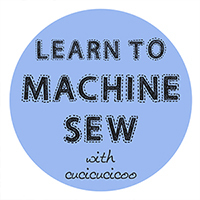 A few days ago I published the latest lesson for the Learn to Machine Sew series on how to sew a simple exposed zipper. 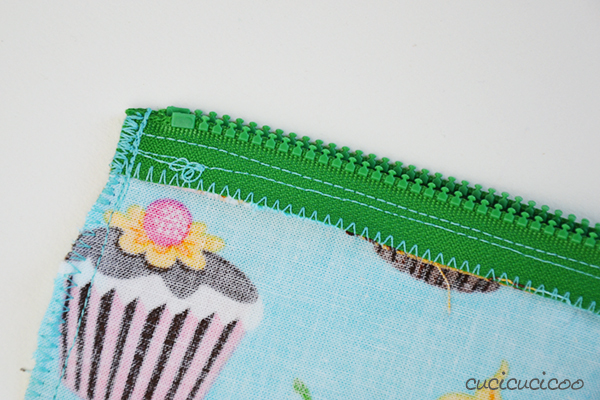 A lot of people are afraid of sewing zippers, but they’re actually really easy to insert once you know how to do it properly! 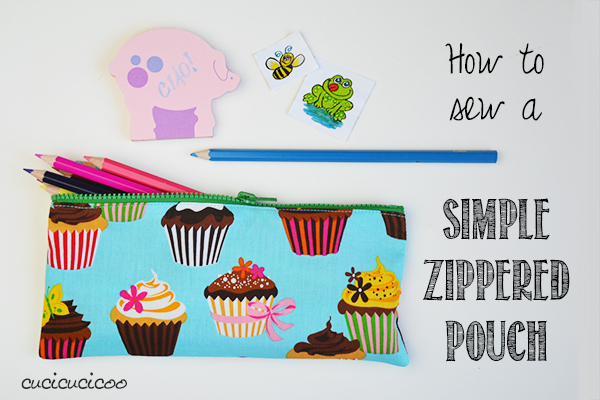 Nobody likes to waste a zipper, so today we’re going to use the practice piece from the zipper lesson and turn it into something useful: a simple zippered pencil pouch! 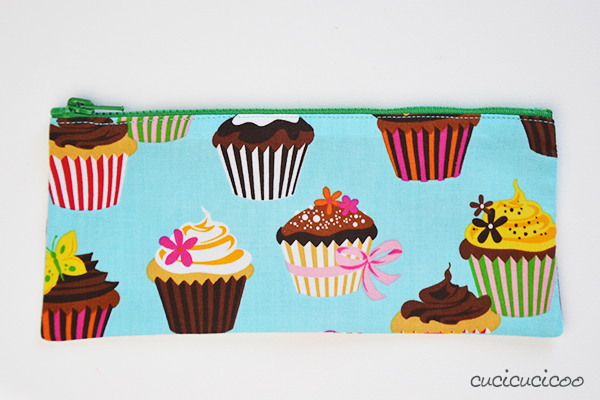 But think outside the box— this type of pouch can be used for all sorts of things, such as crochet hooks or makeup, and it’s even more versatile if you change the size, say to fit knitting needles or for a throw pillow cover! You could even make boxed corners! There are infinite possibilities! So, let’s get started! 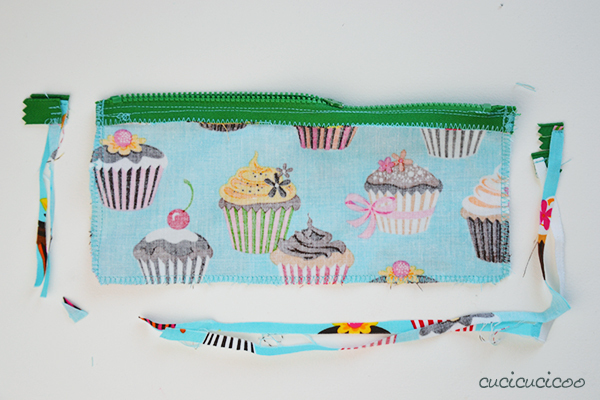 If you have a nylon zipper that is too long for your project, it’s super easy to shorten it! Here’s how. 1. 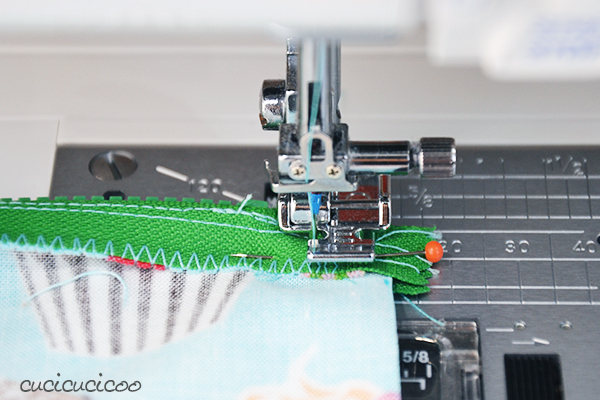 Follow the instructions in my exposed zipper lesson to insert the zipper between the two pieces of fabric. TIP! 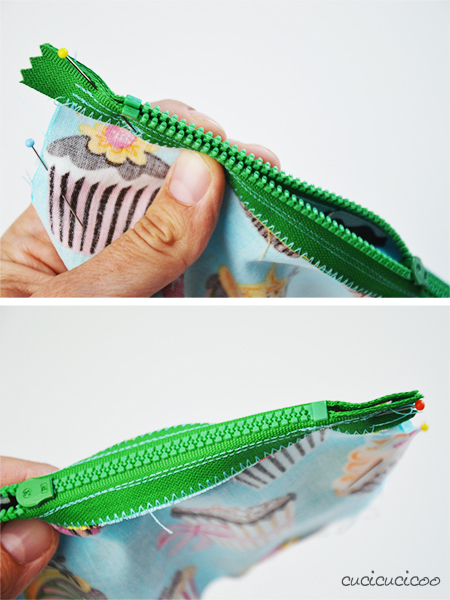 It’s very important to make sure that the zipper is folded in half with the zipper tape folded flat as if it were part of the outside fabric, like you can see in the images above. 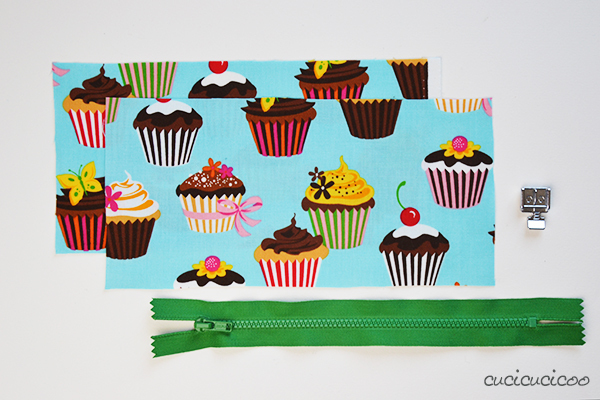 This may seem like a no-brainer when sewing a simple pouch like this without any lining, but if you do add a lining, you have to be sure to fold the zipper tape along with the outside fabric, not the lining fabric. 3. 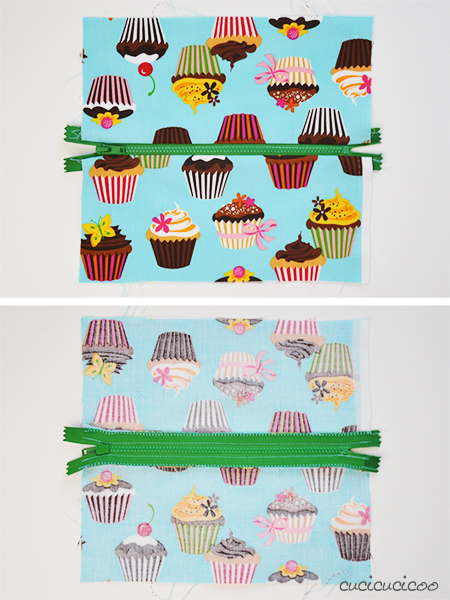 Sew around the three fabric edges using the zipper foot and a 3/8″ (1 cm) seam allowance. I suggest sewing over the zipper tape more than once to strengthen the area. 4. Trim the seam allowances and clip the two bottom corners. 6. Turn the pouch right side out and press it quickly… and you’re done! Now comes the most fun part… filling it up with goodies! 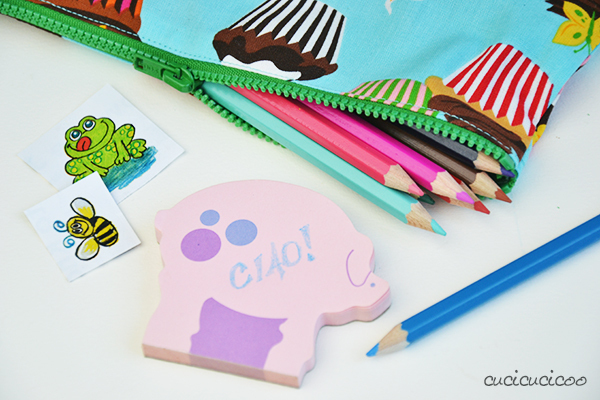 Wouldn’t an adorable little pouch filled with colored pencils, a cute pad of paper and stickers be a great gift for your favorite kid? Come to think of it, a lot of grown-ups would be happy for this type of gift, too! 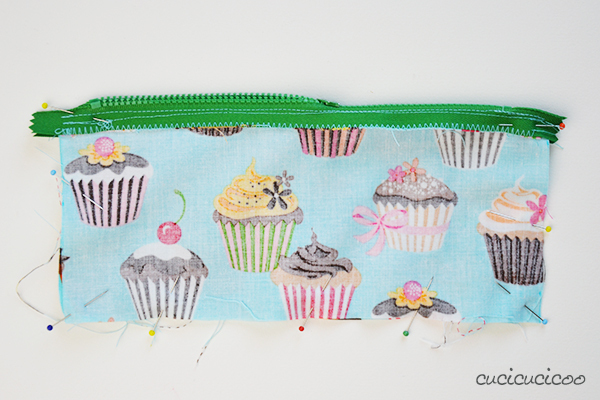 This tutorial on how to sew a zippered pouch is part of the syllabus of Cucicucicoo’s beginner’s sewing course! Don’t forget to share pictures of your pouches (and what you put in them!) on the Cucicucicoo Creations Flickr Group or the Cucicucicoo Facebook page! Grazie, anche se non commento quasi mai guardo sempre i tuoi tutorial e mi piace che fai sembrare tutto molto facile anche se in realtà non lo sia. Proprio questi giorni stavo provando a fare un astuccio da portare in palestra con il telefono, le chiavi….usando pezzi di jeans e ho lasciato tutto perché ero in difficoltà con la cerniera. Adesso credo di aver capito però dovrò ricominciare da capo. Brava!